A group of partners share an awesome vacation home at the lake. Every year they struggle to meet and select who gets which days. During the year, partners want to know who has the cabin but have no place to look it up. 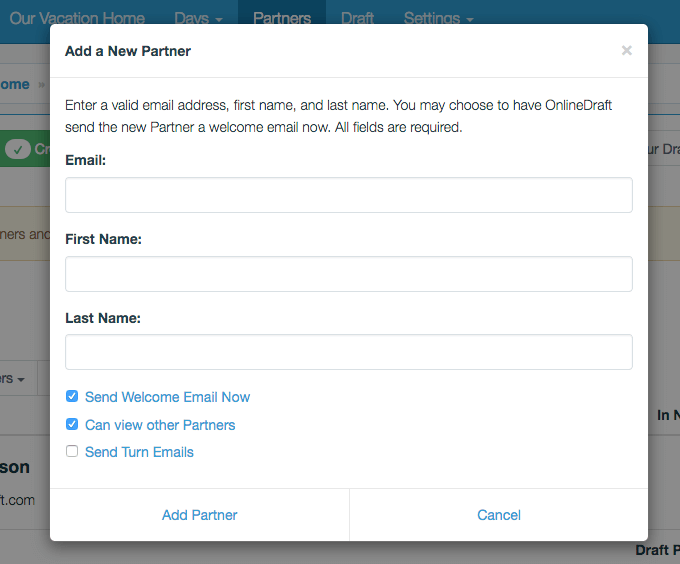 The partners can use OnlineDraft. Enter the dates they want in the draft and set the draft rules. The draft can start whenever they want and can be finished in 30 minutes or take several days. The draft results are populated into a Calendar and available to everyone immediately after the draft and throughout the year. Once you create your free account, click on the start group button. Select a name and continue. 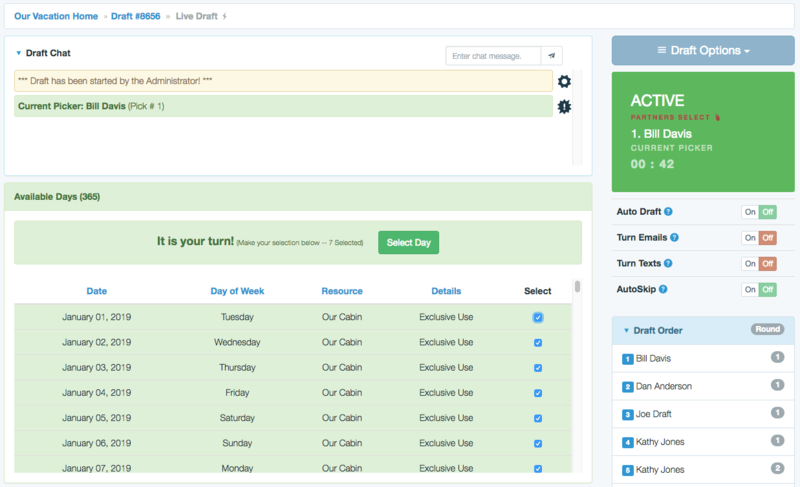 Next, you need to enter which days you want to manage and include in your draft. Select the time frame. This group is drafting the whole year. Note that if they wanted to, this group could easily remove all "Mondays" and/or "Tuesday", or whichever days. With your days all set, add your partners. Partners are added with a name and valid email address. This first question we ask is how many picks will there be in your draft. This group is drafting every week in the year so with 52 weeks in a year, there are 52 picks in this draft. Since we are drafting one week at a time, we set the number of days for each pick to 7. In other words, each pick gets one week. This group shares their vacation home in four equal shares. 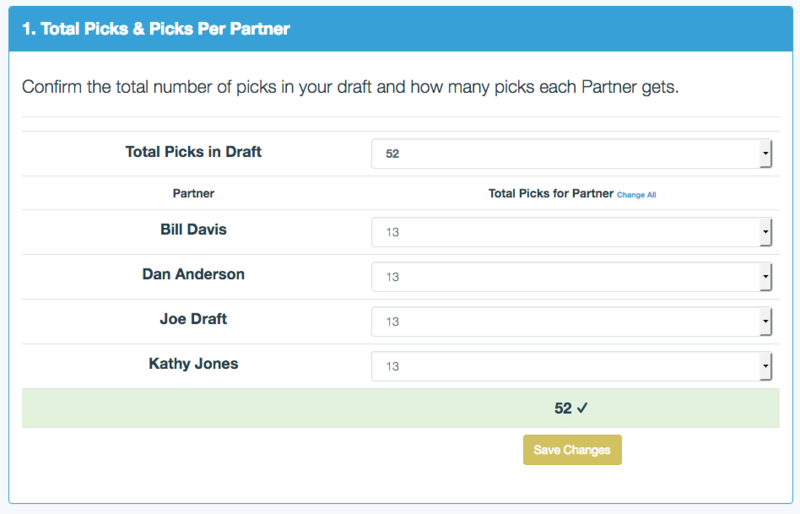 To create the draft order, first enter the number of picks each partner gets in this draft. Each partner gets 13 out of 52 picks. If the group had unequal shares, they would adjust the draft picks accordingly. OK, now the actual order. Use the Draft Order Wizard to quickly assign picks. Use a "repeating" or "snake" draft order. 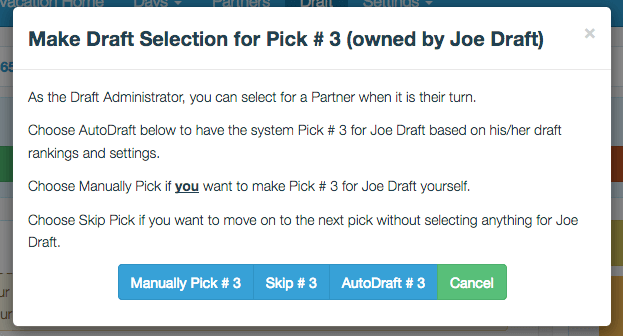 Every pick is changeable so you have complete control of the draft order. Your draft can start whenever you like. If everyone shows up early then start early. If you need to push it back 15 minutes that is fine too. Now the fun part! The Group Administrator has just started the draft. It is Bill's turn. The key parts of his screen turn green and he selects his first week from the AVAILABLE section. Every partner is notified at their turn. The Group Administrator can pick for any partner at any point in the draft. The Group Administrator can also undo the last pick in the draft. All partners have access to the NAVIGATOR. 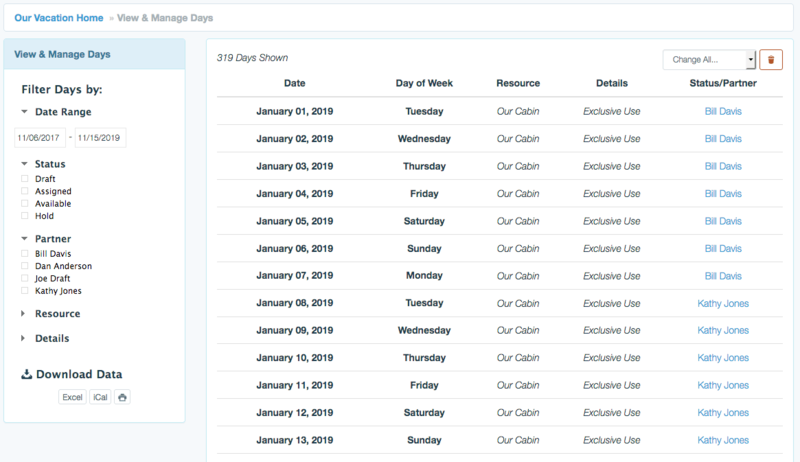 Quickly filter by date or partner to see who has which days. The Group Administrator can make any changes needed here. Download the results to a spreadsheet or calendar file. 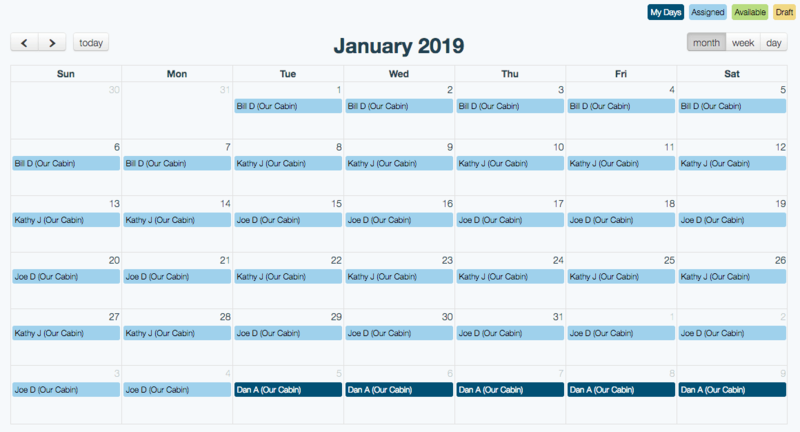 A Calendar view is available as well. 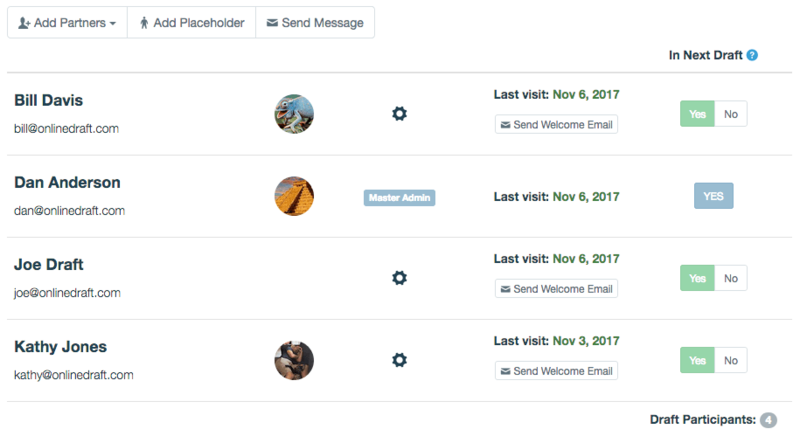 Now all partners have a central place to keep track of their shared vacation home. Much easier! Sharing a vacation home or condominium can also be called Partial Ownership in Real Estate, or Fractional Ownership in Real Estate or Property. 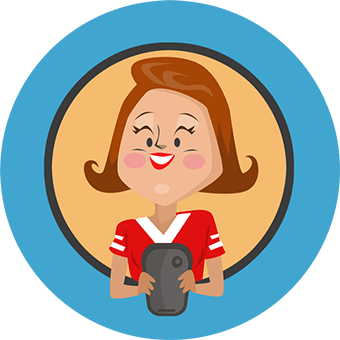 Whatever you call it, OnlineDraft can help you share it! 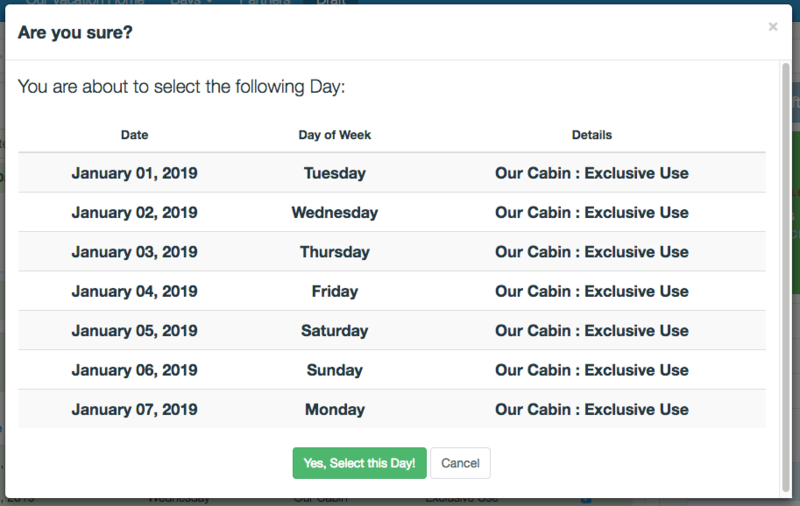 "We used OnlineDraft to select weeks for our vacaction condo between 3 parties; 1 with 50% interest and 2 with 25% each. It worked GREAT for us, and was both efficient and easy to use. Highly recommend!"